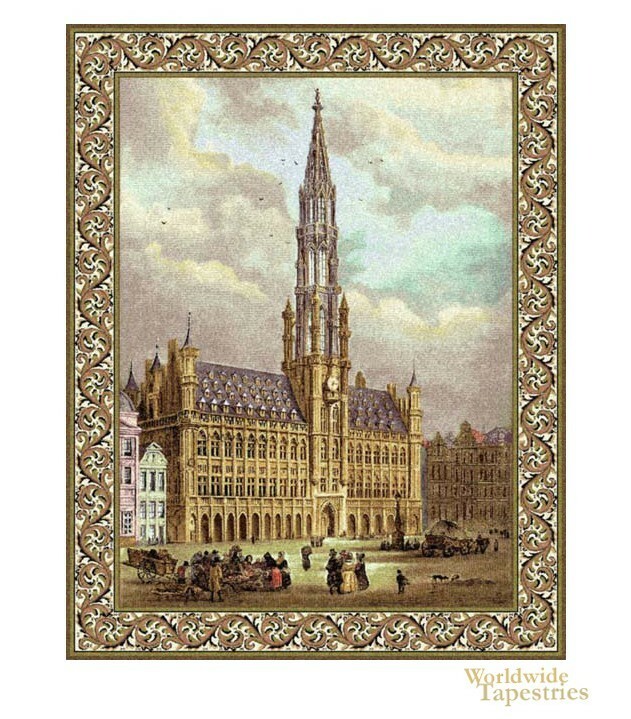 This tapestry shows the Town Hall of Brussels. The Brussels Town Hall is a beautiful gothic creation from the Middle Ages. The oldest section, the left wing, was built in 1402-1420 under the direction of Jacob van Thienen, and the building was subsequently added to. The tall 310 foot tower in Brabantine Gothic style was designed by Jan van Ruysbroek, the court architect of Phillip the Good, was added in 1455. The square tower narrows as it rises to an octagonal tower atop which sits a statue of archangel Michael, the patron saint of Brussels, slaying a dragon. We see atmospheric clouds and a beam of soft light on the villagers enjoying the town square with its beautiful gothic hall. This tapestry “Town Hall Brussels” is lined and has a tunnel for easy hanging. Dimensions: W 33" x H 40"